The Qur’an considers justice as a system governing the universe, which was in place before the creation of humans. Based on the Qur’an and the teachings of the Messenger, Imam ‘Ali defines justice as a process whereby everything is situated in its rightful place intended by the Creator. The rightful place is found by following the Creator’s rules. At the time of the creation of the universe, everything was put in its rightful place according to a scale and balance established by Him creating an ordered and stable equilibrium in the universe. 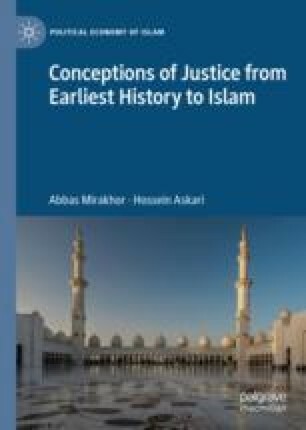 The Qur’an does consider justice as a principle and praises it as a virtue for individuals, but sees its true role as a system, the implementation of which leads to a harmonious, stable, prosperous and balanced society in which humans can flourish in this life and prepare for felicity in the life to come. Mirakhor and Askari, 2017. Ideal Islamic Economy. New York: Palgrave Macmillan is recommended as a complement to this chapter. Also helpful is: Al-Hakimi, et al., 1992. Al-Hayat. Tehran: Maktab Nashr al-Thiqafah al-Islamiyyah, particularly vol. 6, pp. 325–458. Nasr, Hamid Abu Zaid. 2001. The Qur’anic Concept of Justice. Polylog, no. 3. http://www.polylog.org/theme/2.1/fcs8-en.htm.